Philosophical in language and poetic in imagery, this guide to marijuana cultivation promotes the natural approach — outdoors with just soil and sunlight. 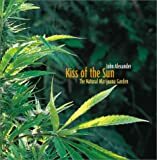 An easy-to-follow guide with a beautiful, contemporary design, The Kiss of the Sun can help anyone tend a successful cannabis garden. This is a great guide to growing this most medicinal plants. There are several close-up photos where you feel like you are sitting right on a branch of the plant. It is about time there was a book on gardening the natural way -- out of the closet and into the yard. Give the plants sunlight rather than electricity. This slim book explain's much about the plant's needs and even how to make seeds for next year's garden.